Every bride wants her wedding day to be perfect. Unfortunately, our skin doesn’t always cooperate the way we want it to. Fine lines, wrinkles, and saggy skin can put a damper on our appearance. While aging skin is inevitable, there are several options designed to smooth and rejuvenate your face for a more youthful complexion. Botulinum Toxin is one of the most popular treatments for reducing wrinkles on the face. Today more and more brides are choosing to undergo non-invasive treatments before their weddings to ensure that they look their very best before walking down the aisle. 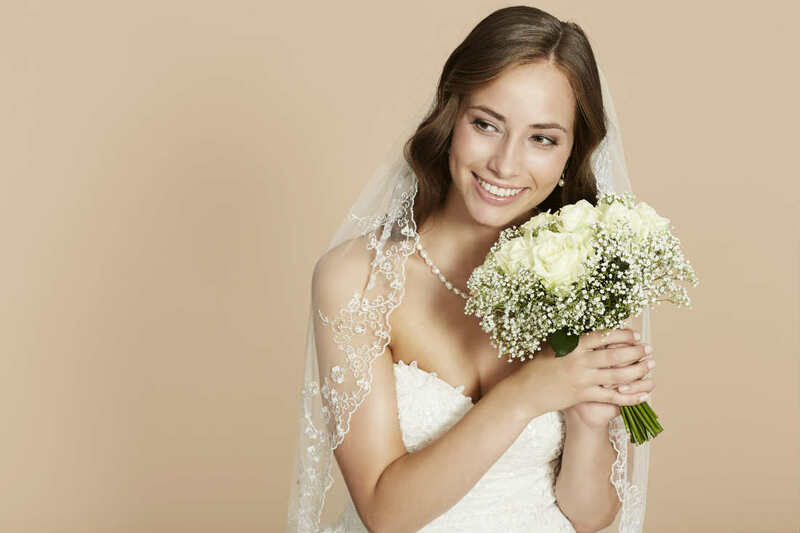 One survey found Botulinum Toxin to be one of the top cosmetic treatment brides seek before their wedding with 14.8 percent of participants interested in the procedure. Botulinum Toxin, in addition to other noninvasive treatments like fillers, lasers, and peels, have the ability to transform the skin and bring out a woman’s natural beauty. Women are not the only ones interested in looking young and attractive at their weddings. Grooms are also undergoing cosmetic procedures to look their best. Whether it’s an eye lift, jaw reduction, or the removal of forehead lines, Botulinum Toxin has the ability to smooth out skin to create youthful, streamlined features. When a couple both receive Botulinum Toxin before their wedding, each partner can feel good about the way they look on their wedding day. If you’re in search of a nonsurgical facelift before your wedding, tryBotulinum Toxin. These injectables contain a toxin produced by the bacteria Clostridium botulinum. When injected into muscles, Botulinum Toxin blocks signals from the nerves to the muscles. This prevents the muscle from being able to contract, which makes wrinkles in that area soften and relax. Botulinum Toxin can be used on everything from crow’s feet to forehead lines. If you’re new to Botulinum Toxin and unsure if you’ll like the results, know that it’s only temporary. Botulinum Toxin generally takes 7 to 14 days until you see the full effects of the procedure. After the treatment, results will generally last between three and six months. You will notice that fine lines and wrinkles will gradually return as the Botulinum Toxin wears off. When this happens, you will need to undergo another treatment to maintain results. After Botulinum Toxin, you may experience some mild, temporary side effects. The most common Botulinum Toxin side effects include bruising, muscle weakness near the injection sight, bleeding, redness, and muscle stiffness. More serious, yet rare, side effects include headaches and eyelid drooping. If you are pregnant, breastfeeding, or have been diagnosed with a neurological condition, you should not use Botulinum Toxin. In some instances Botulinum Toxinwill not work for all wrinkles. Surprisingly, Botulinum Toxin is very affordable and is relatively inexpensive compared to other aesthetic procedures. At Cutis Laser Clinics in Singapore, we generally price Botulinum Toxin by unit as every patient may require a different amount of Botulinum Toxin. When Should You Schedule Your Botulinum Toxin Treatment? For brides or grooms who never had Botulinum Toxin before, try scheduling your treatment at least five to six months before your wedding so in case you are not satisfied with the look it will worn off before your big day. If you like the results, then you can schedule a top up with your doctor at least four weeks before your wedding day. If you had Botulinum Toxin before, your top up will depend on when you had your treatment. If it’s already four to six months or longer since your last Botulinum Toxin treatment, then you need a top up. But if you did your treatment around two to three months before your wedding day, then you don’t need to top up for Botulinum Toxin. If your wedding day is coming up, pamper yourself with a trip to the Cutis Laser Clinics. We offer non-surgical anti-aging and skin tightening treatments designed to firm and smooth out your skin for a youthful look before your big day. A Botulinum Toxin injection is fast, effective, and virtually pain-free, making it the perfect solution for brides and grooms alike. Learn more about Botulinum Toxin Singapore by scheduling an appointment with our skin specialist Dr. Sylvia Ramirez.